It may be an exaggeration to say this — and words that I may be eating back sooner or later — but right now, MAN FROM THE STARS trumps all the other dramas I have watched. I won’t dwell on the drama itself because I have previously blogged on the reasons why it’s worth a watch. 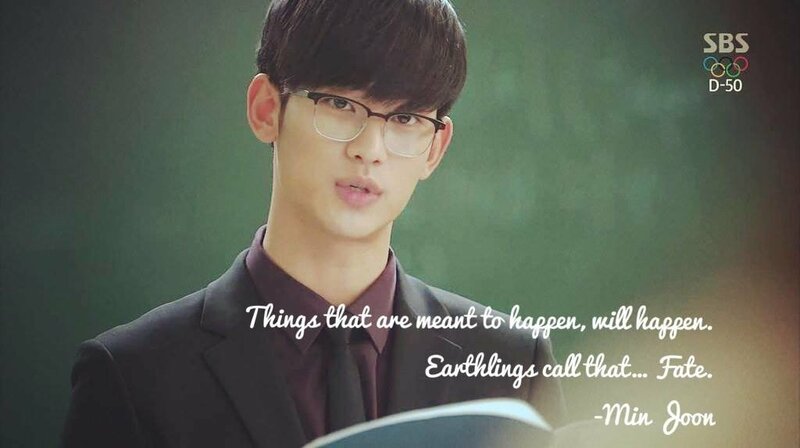 Just to add: Aside from having an alien hero who has lived on Earth for 400 years, MAN FROM THE STARS also gave us a memorable heroine who was progressive and, as someone on dramabeans said, 4-D.
Just a note on the ending: not everyone was happy with it but I was satisfied. It wasn’t perfect but it was logical without losing the heart and message of the story — which was fate and time. And that’s coming from an escapist like me who wants to be spoon-fed her happy ending. I suppose there are things in the universe that we are not meant to understand and that includes the star and the life that aliens like Do Min-joon inhabits. Now with MAN FROM THE STARS over, I wonder what my drama life will be. I am curious about THREE DAYS, the drama following it on SBS. SBS has been on a roll with its dramas, including HEIRS, which rated even higher than MAN FROM THE STARS, and which is one of those things not meant to be understood either. But thank you SBS and the whole production of MAN FROM THE STARS for giving us such a memorable work that stayed solid from episode 1 to 21. Congratulations on your success too! Special thanks to Kim Soo-hyun and Jun Ji-hyun for taking the lead roles, a lot of the success can be attributed to their chemistry and how they played Do Manager and Cheon Song-yi. Finale hit 33.2% in Seoul according to TNS Korea and 29.6% according to AGB Nielsen. Mobile streaming for the finale peaked at 72%. It has attracted at least 800 million views on Chinese video-sharing websites (the Chinese company that bought the rights even before the drama aired expected it to be a hit, but not such a massive hit. They bought the rights for a reasonable price, still cheaper if they produced their own drama; they must be rolling in money now). Tickets for Kim Soo-hyun’s fan meetings sold out in minutes: 30 minutes in Taipei and a freaking ONE MINUTE in Bangkok, according to reports. Yves Saint Laurent No. 52 lipstick that Cheon Song-yi used ran out of stock, an “unprecedented” sale according to the Seoul branch. Stocks of the ShesMiss trench coat that she wears sold out across the country in 10 days. “The Miraculous Journey of Edward Tulane”, the book Do Min-joon reads, became a hard-to-get item on Amazon. Kim Soo-hyun leads in the second wave of Hallyu in China, and might as well across the region. Do Min-joon is now the standard for an ideal boyfriend among women (never mind if he’s an alien). Chicken and beer have become a must in winter. Production companies in China, Taiwan and Hong Kong are just among those scrambling to get the rights to remake the drama (OOOOOH NO NO NO NO NO NO NO NO!!!). Rumors about a movie version are rife with names like Shu Qi and Huang Xiaoming being thrown around (another OOOOOH NO NO NO NO NO NO NO NO!!!). You know a drama is successful when barely has it ended, there are talks of remakes and a movie version. I have never been keen on remakes but a movie version ain’t such a bad idea… IF ONLY it will have the same cast. No one can play Do Min-joon and Cheon Song-yi as well as Kim Soo-hyun and Jun Ji-hyun. Not casting them is a grave sin whether you’re human or an alien. Don’t even think about it. Not in this lifetime. Or even the next 400 years. Araeso? there are people who get turned off by all the hype, and yes, the story. when I first read the plot, I was like — not for me hahahaha! but you’ll get past it because the storytelling is entertaining and the leads are good! I have heard about the movie too and I’m also okay with it but the casting is also my only gripe. It will be such a crime not to cast the original leads. I’m also satisfied with the ending. A lot seems to be fixated about the fact that Cheon Song Yi will grow old and Do Min Joon will not but I think they’re forgetting that ever since, the message of the drama has been for people to enjoy and make most of the limited time we have with our loved ones. I don’t understand why they won’t cast the original leads… unless Jun Jihyun and Kim Soohyun are committed to other projects already. but omg it will be unacceptable not to have them and woe to anyone who will take over the roles! I like how writer-nim did not explain Do Min-joon’s world. Maybe she just didn’t want to bother or didn’t know how to, without making the story even more unbelievable as it already was because let’s face it, an alien lol but it’s just good that there’s a lot of mystery left, that also adds to the appeal of the drama. I’m having withdrawal symptoms too!!! just curious if you’ve watched THE THIEVES. in case you haven’t, that may help. oh, and SBS will be posting what it calls the “full ending” on their website tomorrow. apparently, they had to edit the ending due to time constraints! I have seen THE THIEVES- which had such an open ending for a sequel. That I need. Now. the first time i watched this drama, i automatically think “does this drama have something to do with Starman? (the japanese drama with Fukushi Sota in it, It’s also about alien from star who fall in love with a woman in earth)” What do you think yupki?